How can something be reborn that was not even dead? Well, I guess, it depends on your point of view. Some things might be considered dead although they are at their best health when you encounter them for the first time. As ALiEN told me, the main idea behind ArtCity came up after Gfx-Zone died many years ago. As Pouet was for demos, BitJam was for music, ArtCity was planned to become the source for graphics. The original e107 plug-in version was implemented at that time to serve one purpose: collect and test until the area was built properly. And from that point of view it served its purpose well. The old and first ArtCity banner by Helge. I had my first experience with ArtCity in September 2007. That month I joined the BitFellas community as a member. At the time, ArtCity was nothing more than an e107 auto-gallery plug-in skeleton, with about 1500 pieces of demoscene art hanging at the bones. I remember there were a few artist directories, some party directories, and a few others that from today’s point of view can only be described as examples of database disorder. 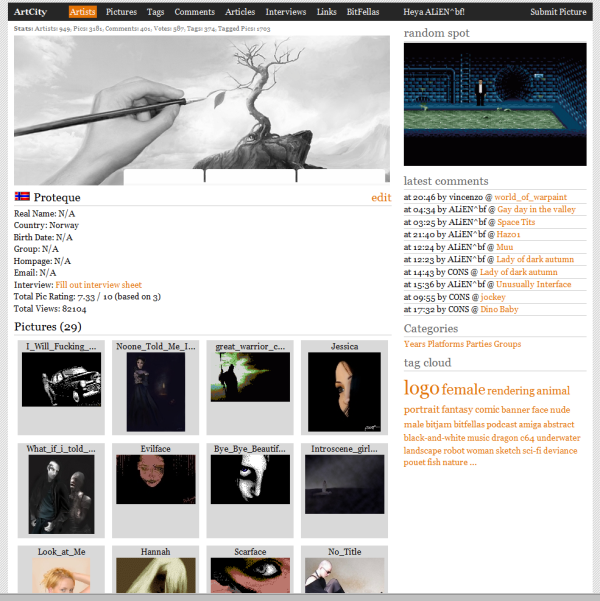 Screenshot from the old e107 plug-in based ArtCity root directory. Nevertheless, it was possible to view pictures, comment on them, and give a rating. One could also browse through the thumbnails of the directory-contents and even text-search for pictures. So basically the plug-in delivered everything one could want to have a pleasant stay in ArtCity. 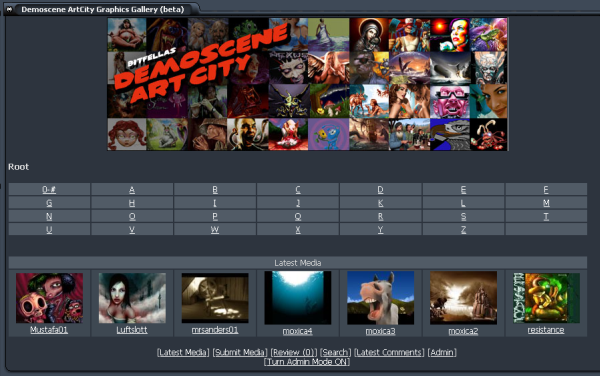 Screenshot from the old ArtCity e107 picture view, rate and comment area. The whole thing was integrated in the main structure of the BitFellas Site, so it never felt anything like a city at all at that time. It was more like a small district of a large town or the smaller brother that was vastly out-shined by its bigger brother BitJam. Despite all of that, it made it uncomfortable to find anything, but I enjoyed being around in the City for hours, looking what small gems it had to offer. And there was a lot to find. I browsed through the galleries, read the comments, commented myself, and mainly took a look at what graphic artists were able to do. I always admired those skills and I still do today, because what a great feeling it must be, to be able to put the pictures you have in your mind onto whatever medium and let them become reality, make them visible for everyone. One day, or shall I say, over a certain period of time, I got the feeling that the activity in the “City” had significantly dropped. No new comments were added and there wasn't any new content coming in. I browsed the forum and found a post from Wade, who felt the same and openly made suggestions on how to improve the City. This was in may 2008 and there were already some things planned for the area that we know now, never made it into reality. I remember that I couldn't get that post out of my head and so one day, it must have been half a year later, I talked to ALiEN about ArtCity and my wish to participate in bringing back activity into that section. I guess there were two things that made me able to follow that idea at that time. The first one was, ALiEN and me were on the same level and he agreed that it would be nice to have that area come alive again, and the second was that I had already done some minor work for BitJam with which I gained the trust necessary to become an admin. "During the next months the galleries grew"
Now there I was, full of ideas on how to give the City a new look - and with a plug-in that wouldn't let you do the slightest changes without protesting. I realized there was not much changeable in the corset of the gallery plug-in, so I concentrated on bringing up new content. And that’s what I did. During the next months, the galleries grew and the overall picture count rose from around 1.500 to almost 4.000. Aside from that, I worked myself into the structure of the gallery, learning how it was built, how comments and ratings were stored, and how it was organized on the ftp. I did that to be able to make changes that the plug-in interface did not support, like moving pictures from one gallery to another without losing its comments and ratings. I know that today that sounds so stupid and simple, and it is, but I can tell you the original plug-in was a pain to work with, because almost no changes were doable without getting an error message from the plug-in, and I was happy to be at least in the position to make small adjustments, to give the whole city a new and reasonable structure. Everything was going OK for months. Sure, we still dreamed of what a bigger, better, and more user friendly ArtCity would look like, but in the middle of 2009 it was a dream and we knew that it would take months, maybe years, to let our ideas become reality - if at all. One day, I remember I was implementing new content and the gallery went down. None of us were extremely worried, because we had experienced smaller downtime before. So I was waiting for someone to fix whatever bug was causing it and go back to business as usual. After one or two days, the gallery was still down and ALiEN and I got to talk. I was informed that the chances were pretty high that something had crashed the plug-in completely. I remember that we thought the amount of pictures at that time brought the auto-gallery plug-in to its limits and beyond. "None of us were extremely worried, because we had experienced smaller downtime before"
The days passed by and ALiEN and I were pretty convinced, that with ArtCity still being down, we had to make a choice between reducing the amount of pictures to a number that the plug-in could handle and waiting for programmers' updates of it. That would have brought the complete project to a standstill and would have made us completely dependent on the help of others that may not even have an idea what the demoscene is and don't give a damn about us having acute problems that needed immediate intervention. So this was a no-go for both of us. The second choice we had was to start ArtCity completely from scratch, with its own code and totally the way we imagined it to be. The biggest problem this choice brought with it, was the need for a coder and since that has always been difficult for BitFellas in general, chances weren't very high to find someone with the time and motivation. This all must have happened around September 2009. Somehow someone managed to get in touch with Georgy from NRS, a Hungarian coder and gfx enthusiast. I don't know who made the contact and who talked him into the project but all of a sudden, we had someone willing and enthusiastic to make our dream of a new ArtCity come true. Later, ALiEN told me, that he knew Georgy for a long time and that the initial contact was made by Gargaj. Funny thing was, they did not talk about ArtCity at that time, but about the possibility to have Georgy take a look at the code of BitJam Radio. Now that we knew we could get it done, we needed to come up with a design for the area. Due to the fact that it would stand completely on its own code-feet, we decided to give it a unique look and not try to force it into the existing BitFellas GFX-Scheme. ALiEN remembered that Xenusion had done a draft for a new site and I contacted him. He was kind enough to send the old schematic drawing over and with a few changes, his design was and still is the basis on what ArtCity is built on. The ArtCity design template Xenusion had made around 2006. It was the basis of today's design. I remember the day we decided to go public with the news that ArtCity will be redone - the 25th of September 2009. With it, we asked for ideas that people had on their minds, what features the new ArtCity should have. The reactions from that announcement couldn't have been more different. While some were enthusiastic (Quote: “Awesome! Really glad to hear it.”) and believed that we could pull it off, others really doubted it (Quote: “Man man man ... when i hear about "restart" overthinking etc ...I am really wondering ... Efficient is different or ?”). Around Christmas 2009 the old gallery plug-in was online again as a placeholder and the planning for the new ArtCity was mostly done. With 2010 came the activity on the code-side. While I was busy getting the existing pictures into a new structure, while not losing any information and gathering new content to create an offline gallery, Georgy was coding the structure with the help of ALiEN, and I was helping with testing and suggesting features. 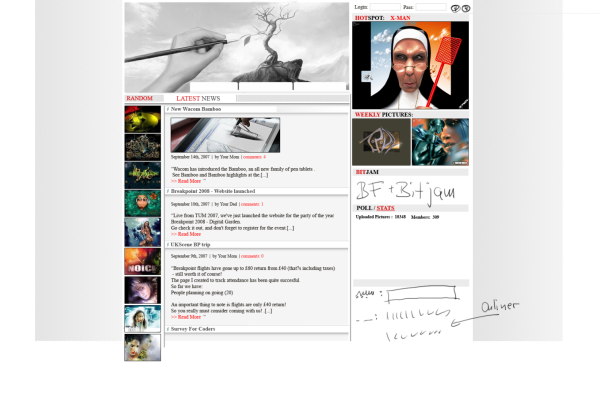 Screenshot of a late beta version of the ArtCity surface. Banner, showcase and various menu items still missing. There were times when ALiEN or I were not available, so the other one took over guiding Georgy through the process. I remember that we had a to-do list we steadily compared and updated that seemed not to get any smaller. The biggest feature, and one we are most proud of is the tag cloud, which allows fast access to specific content and with a search engine that supports multiple tag searching and filtering, and the feature of related tag browsing, it has become a really powerful tool to find what you are searching for. Screenshot of the tag cloud, displaying “all tags”. Colors of the tags suggest its category. In February, after another auto-gallery plug-in crash, we decided not to take any more action in getting it running again, but rather concentrate on finishing the new ArtCity. I remember February of 2010 very well, because it was the month, where all three of us spent several hours DAILY to get the new site up and running in time. And by "in time", I mean the 1st of March 2010. That was the date we set for ourselves to be the launch date of the new ArtCity. Then the first of March 2010 came and most of the things we had in mind were done. I think I won't need to tell you how exhausting it was in the days before the launch. There was almost no other topic than ArtCity. We tested, we clicked, we tagged, we uploaded, we did everything to get a good start with a bug-free version, and in my opinion, we did good. We were able to start with the complete database that I had built with the old plug-in, saved all comments and recalculated the ratings to match the new system. Nothing was lost. In addition we connected ArtCity artist profiles to their respective interviews/surveys at BitFellas and pulled the graphic news from BitFellas onto the front-page of ArtCity, so that everyone is able to access all graphic related information the BitFellas community had to offer. Another welcomed addition was the disk-magazine articles regarding gfx that also were made accessible through ArtCity. All in all we started with a mixture of pictures and gfx related news, interviews, and articles. "We tested, we clicked, we tagged, we uploaded"
The actually used ArtCity head banner. Smaller and with a matching color scheme. After the first few days, one thing became very clear. We, meaning ALiEN, Georgy and me, wouldn't be able to manage all the work by ourselves, since we wanted ArtCity to grow into a multi-platform demoscene art base. So we looked around and found some friends, namely Menace/Spaceballs (Amiga), Diver/4D & Riskej (Spectrum), Veto/Oxyron (C64) who were motivated and willing to help out in their respective field of expertise. Together we should be able to prevent the necessity of another rebirth in a few years. Hopefully. Where do we see ArtCity in a few years from now? First of all, we hope it's still alive and the interest in it is still high. On the technical side we hope to have many more features implemented that we collected and still collect on a new to-do list that isn't getting any smaller at the moment. Some of those ideas we already had when we launched, but many new ones came up during the process. We also received many wishes and ideas from users that won't go unheard. They all go onto the list and hopefully will get implemented one day. If you expect me to state a few of our ideas here, I won't do that, because first, we want to surprise you with something new from time to time - and second, we don't want to put pressure on ourselves by generating an order of implementation. 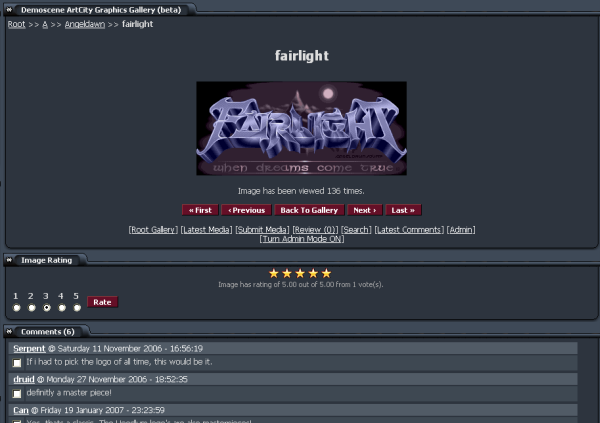 On the content side, we of course hope to expand the gallery itself by collecting as much of the demoscene gfx that are out there as possible, but we also strive for expansion in gfx related news and articles, and last but not least we hope to get more artists to file interviews and information on their work, which in my personal opinion enriches the pleasure of looking at the gfx a lot. Just 5 months after the launch, ArtCity hit rates show that it is as widely accepted as BitJam radio and that it has become a valuable source for demoscene gfx. It features over 2,200 artist profiles and over 12,500 pictures. There are nearly 2,000 comments and over 14,500 ratings given, and over 53,000 tags placed which should make it easier for you to find the things you are looking for. Since the launch, we have been able to welcome many demoscene graphic artists registering themselves on BitFellas and supporting ArtCity with their work, the work of others, and information. It would be too much to thank them all by name in this article, so I do that on behalf of the team here. Thank you so much for your support. You know who you are! "It features over 2,200 artist profiles and over 12,500 pictures"
Finally, thanks to the team (Georgy, ALiEN, Menace, Diver, Veto) for pulling it off, to our supporters in the background (e.g. KF , Vincenzo, Bobic, ne7, KEiTO, Lotek), to the submitters of the first hour (e.g. grass, darklight, tempest, slayer) for making the community grow on a daily basis, and to the visitors for enjoying the content. So go and rate, comment, and of course report pictures that you have information on. We are on a permanent cruise to perfection and we need all your help and knowledge. ArtCity grows on the benefit of all of you. It's what WE make of it! Please don't leave ArtCity now - it got a vital function for cross-platform demoscene pixel art!